A Talon extra light sprocket with groove to help with mud removal. Will fit the Montesa 310, 311, 314 and 315 models, all years, and the Fantic Section 95 - 97. 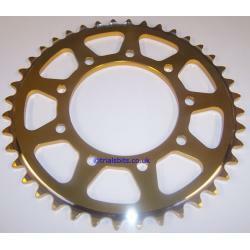 Supplied with 40 or 42 teeth, and in a gold finish, please choose from the dropdown.